Were these the “Final” words? You are drowning. The tide has pulled you under and the turbulent waters are unforgiving. Panic rapidly sets in and you are wide-eyed and fighting to break the surface. Suddenly, panic gives way to dread as the realization sinks in that there is nothing that you can do to save yourself, you are doomed. Just as you give up all hope, surrendering to your fate, a strong hand plunges into the dark depths of the waters and pulls you to safety. You have been saved from certain death and the task of the one who has saved you is finished, yet you will forever be in their debt for coming to your rescue. When all hope of finding true forgiveness of sin seemed gone, Jesus came. When we were drowning in the depths of the dark and murky waters of sin, His hand broke through and saved us. His mission took Him to the cross for us and became our one and only source of salvation. The images of the cross are by no means for the weak of heart. For with these images carries the burdens of sin and humanity as well as the pain and the agony of Jesus Christ. He suffered and died, but the image of the cross should also bring with it hope, resurrection, new life and peace! It was God reaching down into humanity and providing for us a way to safety. When viewing the cross we sometimes focus on the pain and suffering and in so doing we possibly lose sight of Jesus’ victory and our eternal hope! It was divinely appointed, never on accident, purposeful in every way. Sin and death had held humanity in a stranglehold since the fall of Adam and Eve. We were drowning in our sin. But after Jesus’ sacrifice and resurrection, nevermore would death have the final say! Was there suffering? Of course! But with Jesus’ final words, he spoke forth and breathed hope back into humanity’s lungs. With His final words He plucked us up out of the depths and completed our saving. “It is finished”; He utters, loudly enough to be heard by those who had gathered there. What is finished? Life? No, not life, death is finished. The threat of eternal death is finished for those who would seek after Him. Hopelessness in this world is also finished. 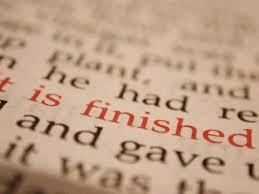 When Jesus declared that it was finished, He was declaring ultimate victory over sin! Mission accomplished! Game over for Satan’s death grip on mankind’s souls! What joy and hope there is in knowing such a Savior! His declaration is for all of humanity! He was not defeated on the cross; instead He declared victory from the cross and from the grave! He was not emptied and destroyed by sin but instead was filled with salvation and love for the sinner. Jesus had finished the ultimate battle, and His trophy would be the embrace of the seekers as they reached the very steps of Eternity. On the cross Jesus ripped open the veil of death and wiped away the transgressions from you and from me. On the cross, visceral pain and suffering occurred, yet life began anew. We were rescued! On the cross, Jesus declared “It is finished” new life has now begun! Next Post Is Jesus a fairy tale? What do YOU believe? The “like” button seems inadequate in response for all Jesus has done for me. If there was a “love” button I would press it repeatedly.